We baked up our share of popular dinner and sandwich rolls at my parents’ bakery but one menu item in particular had a small, cult-like following: golden brown loaves of Jalapeno Cheddar Bread. It was your classic soft, fluffy white sandwich bread, but loaded with shredded sharp cheddar and fresh jalapenos. And they had to be fresh jalapenos. My dad would have it no other way. (To this day, my dad still eats every single dinner with a small plate of jalapeno slices served along side. He’s my hero.) Between the cheese and egg wash, the loaves would turn a deep golden brown – you’d probably guess that it was brioche or unbraided challah and not a Sunbeam-style white bread. 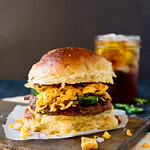 But a couple slices of that bread transformed an ordinary brisket sandwich into a serious Texas brisket sandwich that sent weekend barbeque guests into a frenzy. And substituting the bread for a hamburger bun can make any “plain” burger taste like a fancy, $12 burger-shack creation. To recreate dad’s bread at home, I used my favorite go-to recipe for soft, fluffy white bread and then added a mountain of grated sharp cheddar and a pile of fresh jalapenos from our one pepper plant that survived the winter and is already cranking out peppers like crazy. The cheese disappears into the baked bread, leaving the smell and flavor of cheddar behind. The peppers can make for either a “green” or spicy bite, depending on how hot they were. 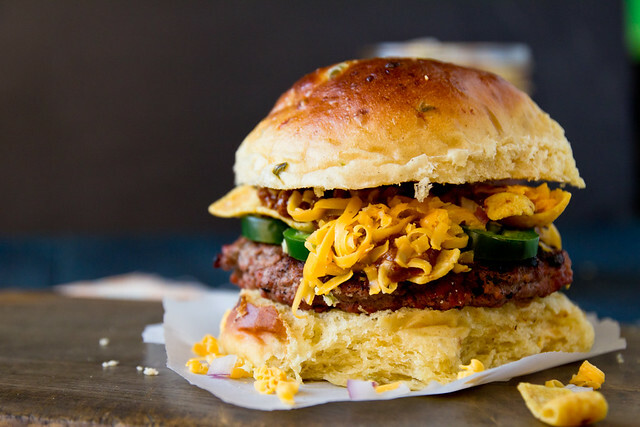 Sharp cheddar and fresh jalapenos transform an ordinary burger bun into a Texas specialty. Brush the buns with the egg wash and bake for 20 to 30 minutes, until golden brown. Let cool 10 minutes before slicing and serving. These burgers look delicious. I like it a lot when burgers recipes change a bit from the ordinary. Creative recipe here. These look (and sound!) amazing! Love that it is burger season. Of course, it is probably always burger season in Texas. Why don’t your parents just give you the recipe for things like these? It is nearly almost always burger season! I actually *do* have all of the old bakery recipes – in all their 15-loaf-yield glory, complete with my dads barely legible shorthand. Holy yum, this looks amazing!! My favorite part is all of that cheese!! I need to try that. Great minds think alike! I have cheddar jalapeno bagels in the oven right now! Love the flavor combination, and I love these buns. I’ll definitely have to give these a try. That looks incredible. I’m salivating. These look to die for! SO glad it is grilling season! Hi, will it be possible to provide the measurement of flour in grams? Thanks for sharing your recipe. I subscribe to the “5oz per 1 cup” method. 3.25 cups = 16.25 oz = 461 grams. Good luck! I’m thinking of black bean burger-ing these babies. it’s gonna be awesome. Jalapeno and cheddar buns are a family favorite, now I must try making my own! YES! I cannot wait to make these for my family and serve them up with some nice cold Shiners. LOVE! 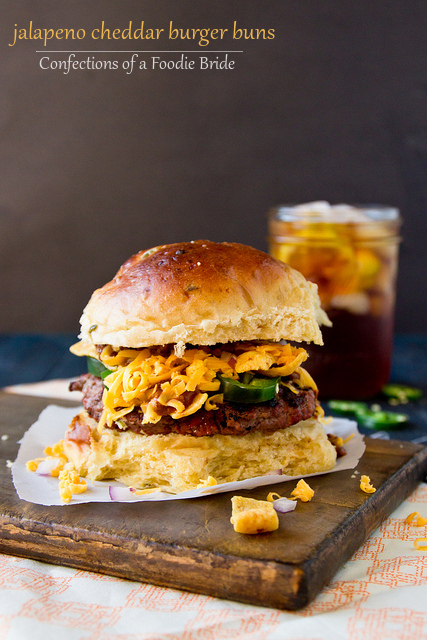 How do you make a frito pie burger? Your buns sound amazing. Sorry, that sounded weird. Ha! I put sliced fresh jalapeños, a small handful of Fritos, a spoonful of chili, some chopped white onion, and copious amounts of grated cheddar on a “plain” hamburger. You need to blog that. It sounds amazing and I’d love something to “pin”! I’m thinking my hubby and I would love these, my kids probably not so much. How long do they stay fresh? Have you had luck freezing them? They freeze great. I freeze them all the time, it makes too many for us to eat in the 2-3 days they stay fresh in a zipper bag on the counter. I need these in my life! They sound and look incredible. Before I blow it, what are your thoughts on subbing half wheat flour? Totally doable. You might use a tad less flour, reserve the last 1/2 cup or so and add it ~2 Tbsp at a time. You also might need a little extra time to achieve doubling status. Do you keep vital wheat gluten on hand? Usually when I sub wheat flour, I add 1 tsp per 1 cup of ww flour. Don’t go out and buy it specifically for this if you don’t already use it, but I do think it helps give the bread better spring and lift when it hits the heat of the oven. A reminder of what i can never have on the table! Wow, I can honestly say I’m tempted to make this RIGHT NOW (late night food cravings). Great recipe and we’ll definitely have to try it out soon! OH MY! My mouth is watering! I can’t wait to try this. Thank you for sharing. Wow This sound amazing! i never thought of adding cheddar cheese to the dough! Love cheddar cheese and i’ll try this very soon! I have always loved your photos, but recently they have just been over the top. Magazine worthy for sure. This burger had me drooling on my keyboard. Keep up the great work! Wow, I cannot wait to try these. I love the story/memory, and can totally see why a bread like that would have its followers! Seriously. That is major. You are making me so hungry as wait for my Hubby to finish getting ready so we can go eat lunch. Jalapeno and cheddar is heavenly flavor combination. Combine it with fresh baked bread….salivating! These look wonderful. I want to make a bunch for a BBQ, what do you think is the best way to freeze them? After I roll them into balls but before I bake them or already baked? I usually freeze burger buns after I’ve baked them – just easier to get them out of the freezer and onto the table for dinner. They should do just fine if you freeze them after you’ve formed them into balls (I do this with dinner rolls a lot). You can set the frozen balls on a baking sheet, covered, for ~2.5-3 hours to thaw and rise. These look delicious! Is there a specific type of yeast to use? I’ve never tried making bread before so I’m a little foreign to the yeast world! Thanks! I use dry active yeast. Red Star in the jar or Fleishmann’s in the packages. I made these tonight, and they were absolutely amazing! Thanks for sharing the recipe! First, I love your recipes! I have been trying a few and everything is turning out beautifully. I do not have a stand mixer but do have a food processor with a plastic blade. I have used that to make my pizza dough which has turned out fine. Will that work for the bread recipes well? These were awesome. I seriously drool when I think about these rolls and I daydream about things to make for dinner that would go with them, just so I can make them again. I made 1/2 with jalapeno and 1/2 without because of the kids. Everyone was so happy with them. I was surprised that the jalapeno wasn’t overwhelming, it didn’t remain hard, it was wonderful tasting and the aroma was incredible. I can not wait to make them again. I’m so glad you’re a fan! They really are my favorite buns. Making these AGAIN tomorrow!! I’ve made them several times and everyone loves them. I’ve also made them into hotdog buns for our gourmet hot dogs and they are so good! Thanks for sharing such a great (and easy) recipe! I don’t have a stand mixer. Is there a way for me to make these without one? Sure, just stir the ingredients when directed to use the mixer (the dough will be stiff) and then knead the dough by hand for 5-7 minutes until elastic. Might consider protecting your hands against the jalapenos with gloves, but other than that, it’s totally doable by hand. I just made these and they were delicious. I don’t have a mixer so they were made by the two best tools God gave me…my hands. When kneading them, I needed just a little extra olive oil. I served these with tex-mex sloppier joes!!! Did you use AP flour or bread flour? I’ve got both and I was just curious since you didn’t specify. Thanks! I’ve got mine rising. Made dough in bread maker, had to use alittle more flour to get texture right. Will let you know how it goes. Local burger joint makes these and will sell the buns for a dollar apiece. Ridiculous! They look just like these. Just made these tonight! Thanks for sharing! These were amazing! I will never buy hamburger buns again! Thanks for sharing! I made these a couple weeks ago for pulled pork sandwiches. They turned out good but tasted quite bland. What can be added to bring some flavor out. More sugar, more salt, etc? Went to a bbq restaurant that served alapeno cheddar buns that were moist like cake., any recommendations to achieve this? How can this be done in a bread machine? Any adjustments to the original recipe? You shouldn’t have to adjust anything, possibly the order of wet/dry ingredients going into the machine (ie, no need to proof the yeast separately). Will be trying them out, thank you for sharing!! OMGOSH !!! These are most probably the BEST yeast rolls I have ever wrapped my lips around ! Made them the other day and my meat-loving husband said he didn’t even NEED supper, all he needed were these rolls…THAT, right there, is high praise, indeed, cos his excluding meat is unheard of ! LOL! Making them for Thanksgiving as well but leaving out the peppers…little ones don’t need it. Thanks again,tho ! AWESOME ! I just took these buns out of the oven and they look and smell like the most amazing burger buns I have ever seen! I can’t wait to make these into frito pie burgers tonight. Thanks so much! These are phenomenal. I shared the recipe with my mom. She loves them. We also mix it up by making rosemary parmesan buns with the same recipe just omitting the cheddar and jalapenos. Love love them. ? I made these tonight and they were great! The only thing I done differently was I made them smaller (roll size). And I used them to make sliders. Will definitely be making them again soon! Thank you so much for the recipe! Excited to try this recipe this week. Recently moved from TX to CO any tips on baking these in a high altitude? Thanks! I had pulled pork cooking away in the slowcooker and then realized I had some cheddar on hand as well as some jalapenos in the garden just begging to be used up. What’s a girl to do? Make your Jalapeno Cheddar Buns, of course! These turned out great and made for some amazing pulled pork, BBQ, and coleslaw sandwiches! I served them with some watermelon and homemade potato salad and it was a pretty epic Sunday meal. Thanks for the great bun recipe! These turned out so, so, SO good! I followed the recipe exactly. Mine took a little longer to rise but I live in humid Houston and it was a rainy old day. I tried just making 6 and they were as big as my head. Eight next time but there will DEFINITELY be a next time! Thank you! Also, can you tell me how to “follow” this blog? I’m on an iPad and can’t seem to figure it out. I am stalking you on Pinterest and Facebook though. Hahaha! Thanks again! These look great! I am going to try them today! 🙂 If I freeze them, how do I thaw and reheat for dinner? Set the freezer bag on the counter and let them come to room temp (probably an hour or so) or use the defrost option on your microwave to speed things along. Than you for the recipe!!! This dough is beautiful! It makes amazing hamburger buns but today I used it to make Kolaches. So, so good! I like to use 3/4 C water and 1/4 jalapeño juice. Thanks for the recipe! It is my go to!